What if we’ve been wrong about David and Goliath this whole time? This is the question posed by Malcolm Gladwell at the center of his new book David and Goliath. Gladwell is the revolutionary brain behind The Tipping Point, Blink, and Outliers – 3 books which revolutionized the business world and my personal thinking as well. Gladwell’s books consistently offer fresh perspective on seemingly obvious thoughts we take for granted about success. 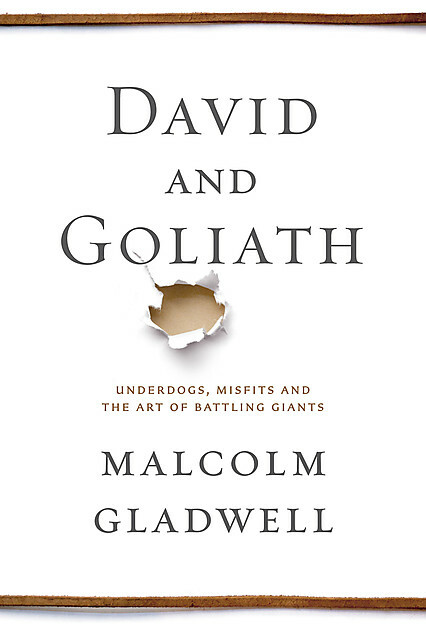 In David and Goliath, Gladwell asks us to rethink the idea of underdogs – the heroes who seemingly overcome great adversity to triumph in battle. Gladwell posits that perhaps some disadvantages are really advantages (and vice versa). The book starts off with a reexamination of the first and greatest underdog story ever recorded – David vs. Goliath. As we all once learned in Sunday School, David was the meager shepherd who, forsaking a warrior’s armor, brought only a slingshot to take down a mighty giant. Generations have been taught this story as an example of the power of God to use the smallest of men to slay the tallest of enemies. But what if David wasn’t the underdog here? What if David was actually the prohibitive favorite against Goliath? Gladwell’s research shows David was not an underdog at all. He was actually a strategic mastermind. Bringing a sling into battle against a heavily armored giant actually put David at an advantage against his mammoth foe. As David saw his slow-moving opponent coming into battle weighed down by heavy armor, he knew he could strike a quick shot by slinging a fastball straight into Goliath’s head before the giant ever saw what was coming. God was on David’s side. But maybe David’s victory was less miracle and more brilliant battle strategy. David and Goliath offers fresh perspectives which will make you rethink Martin Luther King, Jr. and the civil rights battle, the debate over American classroom sizes, and the effects of disabilities. The chapter in the book which most struck me, however, was on the limits of power. Gladwell describes the rising crime rates in a New York City neighborhood and the efforts of the local police to make the city safer. Conventional wisdom would have told the police to crack down on criminals with harsher laws and punishments. Gladwell writes about similar situations where police used fear and intimidation to try to bring down crime. Funny, though, fear and intimidation don’t bring down crime rates. Love does. The police in the town knew they could not come at criminals in the conventional fashion. The conventions of taking down crime were not working. Something radical had to be done. The cops in the neighborhood still prosecuted criminals. But in addition to doing normal police work, they also went about the work of transforming troubled teens with love. They built relationships with broken families. They bought Thanksgiving dinners for every family in the neighborhood. All in the idea that if the police were to have any authority in this town, they must be perceived as legitimate. To be able to affect change, the police had to be seen as people who truly cared about the community. To tackle to the Goliath of rising crime rates, the underdog police force had to change the way they attacked crime. It’s a lesson the church would be well-served to learn. The mission of the church of believers is to go and make disciples of the nations. As Christians we are all called to share our faith with the world around us with the gifts we have been blessed with. We are Davids fighting the Goliath of unfaithfulness in this world. Perhaps it’s time we reexamine our battle strategy. What if, instead of using fear and pressure and intimidation to bully our beliefs across, Christians became known for their love? What if, instead of building a church and expecting the community to come, Christians went into the community and brought meals to the hungry? Over the summer the church I served in launched a project called 40 Days of Ministry. For 40 straight days we performed a different act of service in the local neighborhoods surrounding the church. I’m not trying to brag about our efforts. But this project was a small step forward for a struggling church. It was a message of solidarity with the surrounding community. Acts of service speak louder than any sermon. Unfaithfulness is a Goliath of a problem. The communal church is a David-like underdog trying to bring God’s message to the world at large. As the church we must not be tempted to use our great power and influence to bully the world into belief. We must not battle Goliath the way he wants to be battled. We need to rethink our strategies. Jesus laid the pattern out for us, flipping convention on its ear, turning the other cheek and walking the extra mile. The time has come to rethink the way we tackle Goliath. The time has come to learn the true lesson of the shepherd. How should we as the church rethink the way we tackle spiritual battles? ← Who Goes To The Opera Anymore?